When I first started my home business, I had software for website design, graphic design, checking email, bookkeeping, money management, contact management and more. Today, nearly everything I do is web-based, which saves room and wear and tear on my computer. Further, it allows me to work from anywhere on any device whether it’s my PC, tablet, laptop or phone. Cloud computing is a term you hear more and more, but perhaps you wonder what it means or if it’s right for your home business. Here’s what you need to know about cloud computing and what it can do for you. Cloud computing refers to the ability to store data online (in the cloud) and access it from any device anywhere you can get online. In some cases, it's simple file storage, while in other cases, you can create and change, as well as store data. What are the pros of cloud computing? 1) Money savings. Many online data computing and storage resources offer free use up to a certain amount of data. Even if you need fee-based storage, the money savings over buying software and paying tech support to keep your tech systems running is a consideration. 2) Portability. Cloud computing allows you work wherever and from whatever device you have that can access the Internet without the need of a jump-drive. Instead of saving your data on a portable storage disk, you can save it online and access it somewhere else by going online. This is especially helpful for data access on phones or tablets that don’t have USB ports to access stored files through a jump-drive or other file storage device. 3) Productivity and collaboration. You can get more done faster with your team through cloud computing. Now you don’t have to email back and forth. Everyone can access and manipulate the data through one spot. What are the cons of cloud computing? 1) Security. The biggest concern about using cloud storage is the security of your data. Although there is much you can do to keep your data safe and cloud storage resources work hard to protect their systems and therefore your data, nothing is 100%. 2) Downtime. Cloud computing is dependent on your ability to get online. If yourInternet access is down, so is your ability to get to your data. 3) Lack of cross-platform access. Some cloud storage solutions don’t play nice with others. You need to make sure that the cloud services you use fit your needs and work with the tools you use. 4) Cost. While cloud computing can save you money and time, you need to run the numbers. Perhaps software would be less expensive than a monthly online service. How can cloud computing be used? 1) Data storage. You can save files just like you would on your computer. 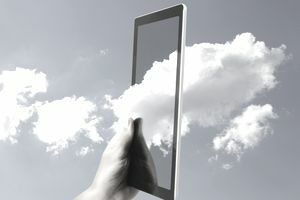 Using the cloud for storage allows you to access the data elsewhere on a different device. For example, perhaps you’re working on a document at home and later went to work at the local java joint. 2) Back up. Losing data is a big fear. Storing your data online can protect you when your computer or storage devices crash or get corrupted. 3) Collaboration. Whether working on a team or just needing your virtual assistant to be able to access your files, cloud computing makes it easy for all involved to get and work with the data. 4) Tools and services. Many big companies have made the move away from selling software toward the subscription cloud-based model. For example, both Microsoft and Adobe have services that allow you to use their applications (i.e. Word or Acrobat) on a monthly cloud-based subscription model. Tools and services you can access on the cloud include office software (i.e. Google Docs), graphic creation (i.e. PicMonkey, Canva), bookkeeping (Quickbooks Online) and note taking (Evernote). What to consider when choosing cloud computing services. While features and costs are a consideration, you don’t want to make your decision based on those alone. Here are some other things to consider in cloud computing services. 1) Encryption. Safety of your data should be your top concern, especially if you’re accessing client information or have other sensitive data needing storage. 2) Automatic syncing. When the file is stored or altered in the cloud, it should be available immediately through other devices. For example, each time you access DropBox, it checks to see if there are new or changed files online for access on the device you’re currently using. 3) Support. Things go wrong and you need to be able to get help when needed. 4) File versioning. This is especially important if you’re working with a team. File versioning creates multiple versions of your file, so can go back to check previous incarnations of your document.